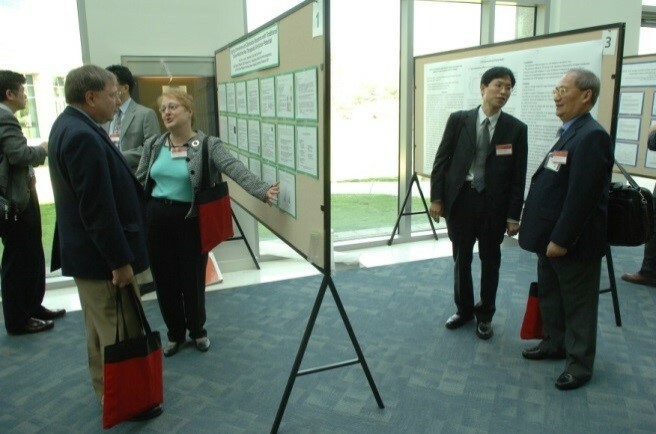 In April 2006, OCCAM/NCI hosted an international conference on ‘Traditional Chinese Medicine and Cancer Research: Fostering Collaborations; Advancing the Science’ at NIH, Bethesda, Maryland. 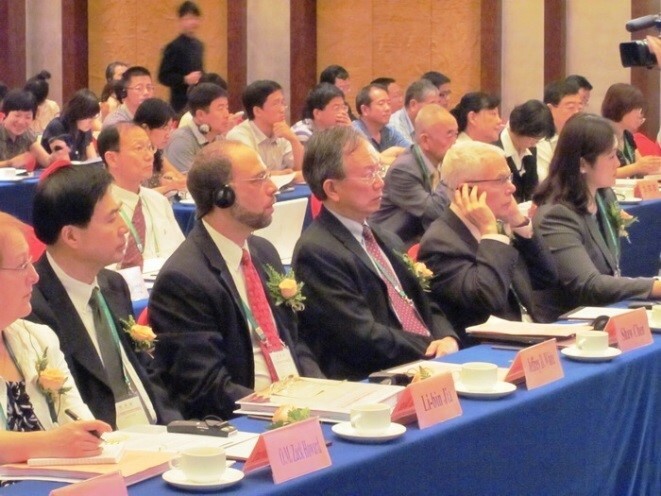 Consecutively in 2011 and 2013, OCCAM/NCI and Cancer Institute, CACMS cohosted two international conferences in Beijing, China on Traditional Chinese Medicine (TCM) and cancer research. These meetings continued to explore the intersection of TCM and Western oncology, and further established the potential value of more dialogs between scientists and healthcare practitioners from different countries (USA, China, Korea, Australia, Singapore) and backgrounds; the potential synergies that can come from joining together complementary resources; and the potential for international scientific communications and collaborations to aid in the modernization of TCM for oncology applications. Drs. Farah Zia (Chair) and Oluwadamilola Olaku (Co-Chair) of OCCAM conceptualized and organized this seminal meeting convened on the NIH Campus, Natcher Auditorium, June 16-17, 2016. It was built on the foundation laid by the 1997 NIH Consensus Development Conference and the 2007 Society for Acupuncture Research (SAR) International Conference. Invited speakers included 19 scholars from the United States, Europe, and China, with expertise in acupuncture and cancer research. Topics included NCI's portfolio on acupuncture, patient needs, safety issues, clinical trial methodology and statistical considerations, cost-effectiveness and reimbursement issues, current state of the science of local and central mechanisms, and gaps in basic and clinical research. The conference affirmed the potential use of acupuncture in the management of cancer symptoms, in which the experts urged further integration into oncology care, and called for establishing a dedicated field for “oncology acupuncture.” A white paper summary will be published in an upcoming special edition monograph of the Journal of the National Cancer Institute (JNCI). With continued support from OCCAM/NCI, the international collaborations between NCI and Cancer Institute of CACMS have reached a new level. On December 19th, 2012, a Cooperative Research and Development Agreement (CRADA) was signed by Dr. Douglas R. Lowy, Director of NCI and Dr. Hongsheng Lin, Director of Cancer Institute of CACMS. The CRADA’s goal is to support collaborative research on the TCM drug Fufang Kushen Injection (FKI), including in vitro cancer cells and in vivo animal mechanistic studies. The parties are studying the ability of FKI to modulate cancer-induced temperature sensitivity and pain, tumor growth and metastases, immune-function, and cross-talk between neuronal and immune systems in certain murine (mouse) tumor models. The CRADA states that the Cancer Institute of CACMS would provide fund to NCI (specifically the Laboratory of Molecular Immunoregulation at CCR/NCI) to help support the study of FKI. Furthermore, Cancer Institute of CACMS would also send fund for visiting Cancer Institute fellows working on the FKI collaborative project at NCI. The CRADA states that Cancer Institute of CACMS will continue supporting this collaboration for 5 years. OCCAM/NCI supported cancer stem cell (CSC) research at the Center for Cancer Research (CCR) of NCI under the senior investigator Dr. William Farrar. New findings from this research shows that compounds from natural products, such as parthenolide (PTL), gossypol (GSP) and Methylselenol (MSA), could target and inhibit the growth of a putative prostate cancer stem cell (PCSC) population. In 2011, with the support from OCCAM/NCI, a new international collaboration study was established between Dr. Farrar’s group and Beijing Guanganmen’ Hospital using compounds isolated from Chinese medicinal herbs to target human prostate cancer cells and PCSC. Cryptotanshinone (CT) — a traditional Chinese medicine herbal compound can regulate the behaviors of both total cancer cells and prostate tumor initiating cells (TICs). CT can target cellular proliferation, cell cycle status, migration, viability, colony formation and sphere formation. CT can down-regulate stemness genes, such as Nanog, Oct4, Sox2, b-catenin, CXCR4 in TICs. CT can target the LNCaP CD24+ CD44+ cell population that is representative of prostate TICs. A research paper of this study entitled Cryptotanshinone targets tumor-initiating cells through down-regulation of stemness genes expression has been published on Oncology Letters, 2016. Zhang Y, Cabarcas SM, Zheng J, Sun L, Mathews LA, Zhang X, Lin HS and Farrar WL. Cryptotanshinone targets tumor-initiating cells through down-regulation of stemness genes expression. Oncology Letters. 2016, 11:3803-3812. 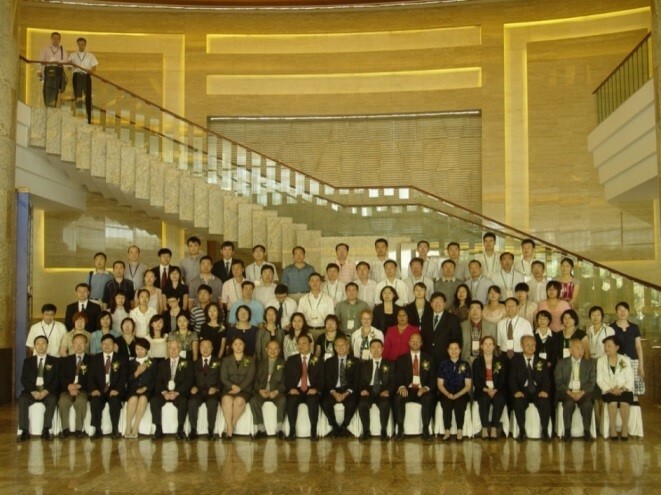 As a follow-up to OCCAM’s “Traditional Chinese Medicine and Cancer Research: Fostering Collaborations; Advancing the Science” conference in April 2006, OCCAM and Beijing Guanganmen Hospital established an international collaboration to study TCM herbal medicines. With support from OCCAM/NCI, two TCM anticancer herbal medicines clinically used in China were studied in the NCI intramural research program by Drs. Joost Oppenheimer and Zack Howard at the Laboratory of Molecular Immunoregulation, Center for Cancer Research (CCR). Visiting fellows from Beijing Guanganmen Hospital work in the lab for the joint studies. One of the TCM medicines studied was Sheng Qi Formula (SQF). SQF is used clinically at Beijing Guanganmen Hospital for reducing cancer patients’ chemotherapy side effects and enhancing the efficacy of conventional cancer therapy. SQF contains Astragalus mongholicus Bge, and Panax notoginseng. The second TCM medicine studied called Fufang Kushen Injection (FKI), which contains the extracts from Sophora flavescens and Rhizoma Smilacis Glabrae. Based upon early studies and clinical applications in China, FKI has been found to show anti-cancer activity and pain relief efficacy. It is widely used clinically for cancer patients in China. Combination therapy with SQF and Taxol or SQF and Cyclophosphamide resulted in additive reduction in tumor growth and mixed effects on myeloid derived suppressor cells (MDSC). Combination therapy with SQF and Gemcitabine resulted in complete blockade of 4T1 tumor growth in 70% of the treated animals. A liquid chromatography/mass spectrometry method was developed to quantify saponins in SQF. Rg1, Re, Rb1, Rd and AsII have been chosen as fingerprint chemicals because of their degree of separation in LC/MS. Retrospective studies of the chemical fingerprints and tumor effects have identified a functional chemical fingerprint. An in vitro bioassay used prior to formulation of SQF has been recently been developed. In vitro studies of Rg1, Re, Rb1, Rd and AsII alone and in-combination demonstrated that the Sapoins are not the only functional components of SQF. In vitro studies of SQF showed a direct apoptotic effect on 4T1 tumor cells. In vivo metabolic studies of Balb/c naïve and tumor bearing mice treated with SQF showed that SQF has a profound effect of glycolysis and fatty acid metabolism. FKI is a mixture of TCM extracted from the roots of two herbs — Sophora flavescens and Heterosmilacis Japonica. FKI is used alone or combined with conventional chemotherapy to treat lung and other cancer patients in China improving anticancer efficacy and reducing the side effects of chemotherapy. In order to fully explore the effects of FKI, and a more complete mechanismof FKI action, and optimal dosing in combination with chemotherapy, Dr. Zack Howard of CCR/NCI and Dr. Zhizheng Zhao, visiting fellow from Cancer Institute of CACMS began a systematic study on FKI. They had confirmed that FKI reduces tumor growth and tumor-induced hyperalgesia in a murine sarcoma model. In addition, they began to define an optimized FKI dosing schedule in the murine sarcoma model. To better utilize FKI and target responsive tumors, they were actively investigating the mechanism of action of FKI for its anti-cancer effect. The study results showed that FKI not only decreased the size of the tumor, but also decreased hyperalgesia induced by sarcoma as well as TRPV1 and ERK phosphorylation. In vitro assays have demonstrated FKI has a selective in vitro cyto-toxic effect for sarcoma cell lines. Studies’ results suggest that FKI at 25 mg/kg reduces tumor-induced temperature sensitivity; FKI at 50 mg/kg reduces tumor-induced temperature sensitivity and sarcoma growth. FKI could reduce not only tumor-induced temperature sensitivity but also growth of the implanted sarcoma tumor that grew around the sciatic nerve causing the tumor-induced pain. FKI decreased hyperalgesia induced by sarcoma as well as TRPV1 and ERK phosphorylation. In an animal model, it has been confirmed that twice a day dosing makes FKI more effective than single dosing. In vitro study also showed that FKI’s anticancer activity might be due to inhibition of Erk phosphorylation. In July 2011, Dr. Zack Howard of CCR/NCI and Dr. Libin Jia of OCCAM/NCI visited Zhendong Group, the pharmaceutical manufactures of FKI, in Shanxi province, China to better understand how to grow and collect the quality raw materials of herbs used for FKI. Dr. Howard gave a presentation on her study of FKI and Dr. Jia introduced OCCAM's international cancer complementary and alternative (CAM) studies, including the FKI collaboration study with the Cancer Institute, CACMS. Drs. 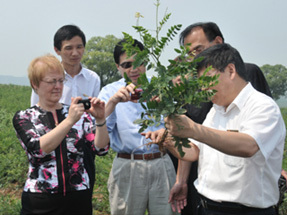 Zack Howard and Libin Jia visited herbal only plantation field of Sophora flavescens in Shanxi Province, China in July 2011. Dr. Zack Howard of CCR/NCI gave a study presentation on FKI research at Zhendong Group where the FKI is manufactured in July 2011. Zhao Z, Fan H, Higgins T, Qi, J, Haines, D, Trivett, A, Oppenheim, JJ, Wei, H, Li, J, et al. Fufang Kushen injection inhibits sarcoma growth and tumor-induced hyperalgesia via TRPV1 signaling pathways. Cancer Letters. 2014, 355: 232-241. Three human colorectal cancer cell (CRC) lines (HCT116, SW480, LOVO) were treated with the commonly used TCM compound berberine. A cell proliferation assay was used to evaluate the inhibition effects on cell growth. The results showed that berberine inhibits the growth of all three CRC lines. Research showed that berberine activated AMP-activated protein kinase (AMPK) in a dose-dependent and time-dependent manner. In addition, mammalian target of repamycin (mTOR), a downstream target of AMPK, was down-regulated by berberine in a dose-dependent and time-dependent manner. Furthermore, the downstream targets of mTOR - 4EBP1 and p70s6 kinase were also down-regulated by berberine treatment in three colon cancer cell lines. In vivo studies demonstrated that berberine treated mice showed a significant reduction of tumor number and tumor size compared to vehicle treated mice. It is evident that berberine inhibits colon cancer cell growth and decreases carcinogens azoxymethane initiated-dextran sulfate sodium (AOM/DSS) induced tumor numbers and tumor size. The study data suggest that berberine suppresses colon epithelial proliferation via inhibition of mTOR through the activation of AMPK. This study demonstrates that berberine might offer a safe and promising candidate for chemoprevention of colon cancer. An abstract titled ‘Berberine suppress the colon cancer proliferation through activating AMPK’ from this study was presented on the AACR 2013 annual meeting in Washington DC in April, 2013 and the results from this study were published on line in Molecular Carcinogenesis, 2014. Li W, Hua B, Saud SM, Lin, H, Hou, W, Matter, MS, Jia, L, Colburn, NH. and Young, MR. Berberine regulates AMP-activated protein kinase signaling pathways and inhibits colon tumorigenesis in mice. Mol. Carcinog. 2015, 54:1096-1109 (PMID: 24838344). Li W, Saud SM, Young MR, Chen G, Hua B. Targeting AMPK for cancer prevention and treatment. Oncotarget. 2015, 6:7365-7378 (PMCID: PMC4480686). Drs. Weidong Li, Nancy Colburn and Mathew Young and other members of the Laboratory of Cancer Prevention of CCR also jointly studied another herb compound Resveratrol on its inhibition activity to prevent tumorigenesis caused by K-ras activated sporadic colon cancer. The study suggested that resveratrol can prevent the formation and growth of sporadic colorectal cancer in mice by downregulating K-ras expression. Saud SM, Li W, Morris NL, Matter, MS, Colburn, NH, Kim, YS. and Young, MR. Resveratrol prevents tumorigenesis in mouse model of Kras activated sporadic colorectal cancer by suppressing oncogenic Kras expression. Carcinogenesis. 2014, 35:2778-2786 (PMCID: PMC4247523). Similarly, in an in vitro study, Drs. Li, Young, Colburn and Hua, and Mr. Saud determined the effects cryptotanshinone (CPT), an extract from herbal medicine, on colorectal cancer cell proliferation and growth. Their study showed that CPT inhibited the growth and cell viability of multiple colorectal cancer cell lines. CPT inhibited activation of Signal transducer and activator of transcription 3 (Stat3), a transcription factor that mediates expression of many genes known to regulated tumor growth. Their findings suggest that CPT could be used for both prevention and treatment of colorectal cancer by inhibiting activation of Stat3. Li W, Saud SM, Young MR, Colburn NH, Hua B. Cryptotanshinone, a Stat3 inhibitor, suppresses colorectal cancer proliferation and growth in vitro. Mol Cell Biochem. 2015, 406: 63-73 (PMID: 25912550). Since 2008, OCCAM/NCI started collecting pure compounds and medicinal herb extracts through international collaborative projects through Memorandum of Understanding (MOU) agreements. Up to 349 pure compounds and 200 extracts have been collected from three institutes in China (Kunming Institute of Botany; Key Laboratory of Chemistry for Natural Products (KLCNP) in Guizhou Province; and Institute of Matera Medica, China Academy of Medical Sciences). 74 pure compounds have been screened (1-dose, e.g. =10-5 Mole) on NCI 60 human cancer cell lines; 14 of them entered to 5-dose (10-3, 10-4, 10-5, 10-6, 10-7 Mole each) screens. More compound screenings on NCI60 human cancer cell lines are under testing. 26 compounds have been screened on 7 cell target assays (GP78, PLK1, NF1, EpCAM, META, SUMO, p38) with certain hits; 152 medicinal herb extracts have been screened on 8 cell target assays (GP78, NF1, EpCAM, MALT1, p38, SUMO, TRAIL and META) with certain hits. Hit extracts or compounds will be further tested on cell target assays. Following a successful pilot study, the NCI was supporting a cooperative agreement to develop the International Center of Traditional Chinese Medicine for Cancer Treatment (ICTCM) that partners the University of Texas M. D. Anderson Cancer Center (MDACC) with the Cancer Hospital, Fudan University in Shanghai, China (Project number: 3U19CA121503). While NCI supported research in individual topics related to TCM, such as acupuncture, these were the first NCI grants to support the development of an international collaborative partnership to study multiple aspects of TCM. Researchers with the center investigated the benefits of some traditional Chinese medicine (TCM) treatments for cancer patients. During the 2-year pilot study that began in 2003 and was funded by an NCI grant (R21CA108084), the ICTCM investigated 3 aspects of TCM: 1) herbal and natural treatments that target the disease and related symptoms; 2) acupuncture for some side effects of cancer treatment; and 3) the bio-behavioral effects of qigong and other mind/body interventions. This work was advanced further under a new 4-year cooperative agreement, which was also extended for two additional years. The investigators completed Phase I clinical trials on huachansu (a TCM therapy derived from sterilized toad skin extract), acupuncture to prevent prolonged postoperative ileus, and qigong for women with breast cancer. Phase II clinical trials of huachansu combined with gemcitabine in patients with advanced pancreatic cancer, and acupoint stimulation to prevent chemotherapy-induced nausea and vomiting were finalized and data analyses are ongoing. Another study combining tai chi and qigong was completed and the results have showed that these mind-body techniques could lower distress and lead to improvements of different aspects of quality of life. The phase I trial of huanchansu for the treatment of patients with advanced hepatocellular carcinoma, non-small cell cancer, and pancreatic cancer was completed. In this trial, huanchansu showed to be well-tolerated and could result in disease stabilization in patient subsets. A study on bufalin, a component of huachansu, showed that Na+/K+-ATPase α3 might serve as a therapeutic target for bufalin in hepatocellular cancer, and its expression status may help predict sensitivity of HCC cells to bufalin treatment. ICTCM has shown to be central in building new collaborative studies. Dr. Lorenzo Cohen, PI and his team were able to secure a new grant with Fudan University entitled “Placebo Controlled Trial of Acupuncture to prevent Radiation-induced Xerostomia” (R01CA148707). Lu Q, You J, Kavanagh A, Warmoth K, Meng Z, Chen Z, Chandwani KD, Perkins GH, McQuade JL, Raghuram NV, Nagarathna R, Liao Z, Nagendra HR, Chen J, Guo X, Liu L, Arun B, Cohen L. Differences in quality of life between American and Chinese breast cancer survivors. Support Care Cancer. 2016, Apr 6. [Epub Ahead of print]. Shen Y, Liu L, Chiang JS, Meng Z, Garcia MK, Chen Z, Peng H, Bei W, Zhao Q, Spelman AR, Cohen L. Randomized, placebo-controlled trial of K1 acupoint acustimulation to prevent cisplatin-induced or oxaliplatin-induced nausea. Cancer. 2015, Jan 1;121 (1) 84-92. Chen Z, Meng Z, Mibury K, Bei W, Zhang Y, Thornton B, Liao Z, Wei Q, Chen J, Guo X, Liu L, McQuade J, Kirschbaum C, Cohen L. Qigong Improves quality of life in women undergoing radiotherapy for breast cancer: results of a randomized controlled trial. Cancer 2013, May 1;119(9):1690-1698. Meng Z, Kay Garcia M, Hu C, Chiang J, Chambers M, Rosenthal DI, Peng H, Wu C, Zhao Q, Zhao G, Liu L, Spelman A, Lynn Palmer J, Wei Q, Cohen L. Sham-controlled, randomized, feasibility trial of acupuncture for prevention of radiation-induced xerostomia among patients with nasopharyngeal carcinoma. Eur J Cancer. 2012, Jul;48(11):1692-1699. Meng Z, Garcia MK, Hu C, Chiang J, Chambers M, Rosenthal DI, Peng H, Zhang Y, Zhao Q, Zhao G, Liu L, Spelman A, Palmer JL, Wei Q, Cohen L. Randomized controlled trial of acupuncture for prevention of radiation-induced xerostomia among patients with nasopharyngeal carcinoma. Cancer. 2012, Jul 1;118(13):3337-3344. Li H, Wang P, Gao Y, Zhu X, Liu L, Cohen L, Meng Z, Yang P. Na+/K+-ATPase a3mediates sensitivity of hepatocellular carcinoma cells to bufalin. Oncol Rep. 2011, Mar;25(3):825-830. Ouyang H, Wang P, Meng Z, Chen Z, Yu E, Jin H, Chang DZ, Liao Z, Cohen L, Liu L. Multimodality treatment of pancreatic cancer with liver metastases using chemotherapy, radiation therapy, and/or Chinese herbal medicine. Pancreas. 2011, Jan;40(1):120-125. Meng Z, Yang P, Shen Y, Bei W, Zhang Y, Ge Y, Newman RA, Cohen L, Liu L, Thornton B, Chang DZ, Liao Z, Kurzrock R. Pilot study of huachansu in patients with hepatocellular carcinoma, nonsmall-cell lung cancer, or pancreatic cancer. Cancer. 2009, Nov 15;115(22):5309-5318. Meng ZQ, Garcia MK,Chiang JS, Peng HT, Shi YQ,Fu J, Liu LM, Liao ZX, Zhang Y, Bei WY, Thornton B,Palmer JL, McQuade J, Cohen L. Electro-acupuncture to prevent prolonged postoperative ileus: a randomized clinical trial. World J Gastroenterol. 2010, 16:104-111. McQuade JL, Meng Z, Chen Z, Wei Q, Zhang Y, Bei W, Palmer JL, Cohen L. Utilization of and Attitudes towards Traditional Chinese Medicine Therapies in a Chinese Cancer Hospital: A Survey of Patients and Physicians. Evid Based Complement Alternat Med. 2012:504507, 2012. e-Pub 10/2012. PMCID: PMC3475319. Chaoul A, Mibury K, Sood AK, Prinsloo S. and Cohen L. Mind-body practices in cancer care. Current Oncology Reports, 2014, 16(12):417. 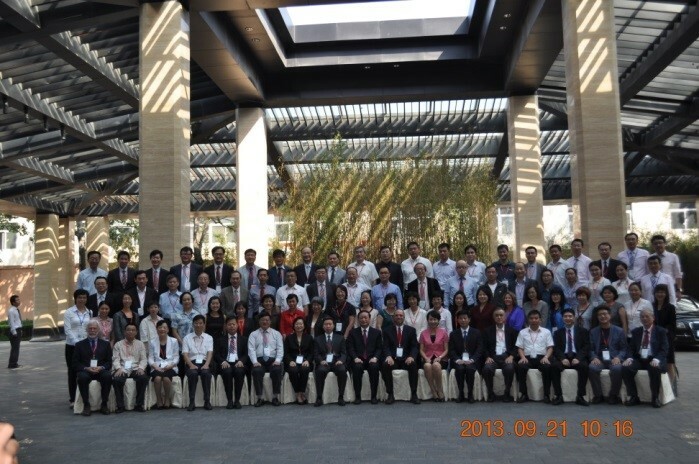 NCI supported International Center of Traditional Chinese Medicine for Cancer Treatment (ICTCMCT), China. Drs. Lorenzo Cohen of MD Anderson Cancer Center, University of Texas, US and Luming Liu of Fudan Cancer Hospital, Shanghai, China shook hands on the establishment of the ICTCMCT. Investigators at Harvard University in collaboration with the Chinese University of Hong Kong and Hong Kong Baptist University intended to systematically evaluate traditional Chinese medicine (TCM) botanicals for their anti-cancer properties (Project number: 5U19CA128534-04). The objectives were to establish and maintain a library of authenticated TCM botanical extracts for scientific evaluation, to create a high throughput and combinatorial screening core to test the botanicals individually and in combination for their activity in bioassays relating to cancer, and to test extracts and fractions with optimal activity in relevant animal tumor models. The Center consisted of two projects: selective cytotoxicity and angiogenesis, and three cores: administrative, botanical acquisition and authentication, and screening and chemical characterization. The project was started in September 2006 with an expected ended date of July 2011. The findings of these projects may have translational potential into clinical investigations for cancer treatment. It may establish a future model for systemically evaluating botanicals traditionally used for the treatment and prevention of cancer. In addition, this cooperative agreement afforded the potential for an important public/private partnership to move the field of traditional Chinese herbal medicine significantly forward. Since 2012, this TCM botanical material collection (over 300 samples) from above project was transferred to the Natural Products Branch, Division of Cancer Treatment and Diagnosis of NCI for continuing study on their anticancer activities using different screening and testing systems, including the NCI 60 human cancer cell lines. Primary data have showed that certain TCM herb extracts can inhibit grow of many cancer cell lines. Eisenberg DM, Harris ES, Littlefield BA, Cao S, Craycroft JA, Scholten R, Bayliss P, Fu Y, Wang W, Qiao Y, Zhao Z, Chen H, Liu Y, Kaptchuk T, Hahn WC, Wang X, Roberts T, Shamu CE, Clardy J. Developing a library of authenticated Traditional Chinese Medicinal (TCM) plants for systematic biological evaluation--rationale, methods and preliminary results from a Sino-American collaboration. Fitoterapia. 2011, Jan;82(1):17-33. 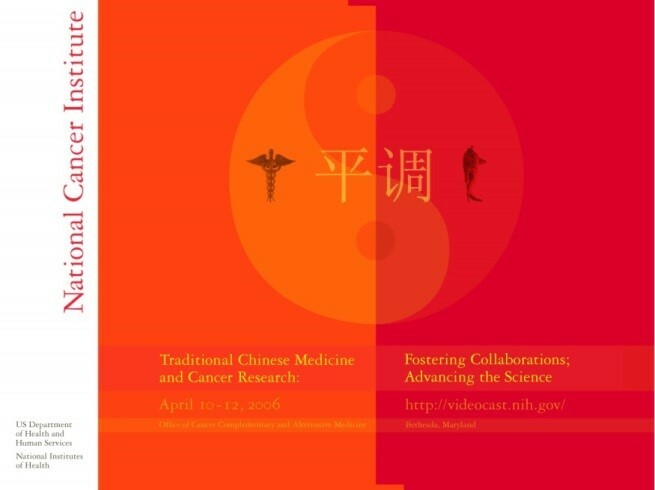 In February 2014, the Cancer Institute, CACMS presented OCCAM/NCI with a proposal for an international consortium with the aims of improving scientific communications and collaborations, improving the quality of research on Chinese medicine for oncology applications, finding potential promising Chinese medicine (CM) drugs and modernizing the research of CM for cancer. 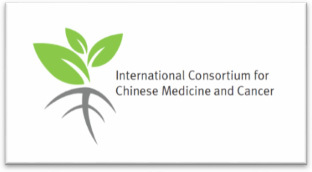 NCI’s OCCAM agreed to work with CACMS to explore the feasibility of establishing an international consortium for Chinese medicine and cancer (ICCMC). 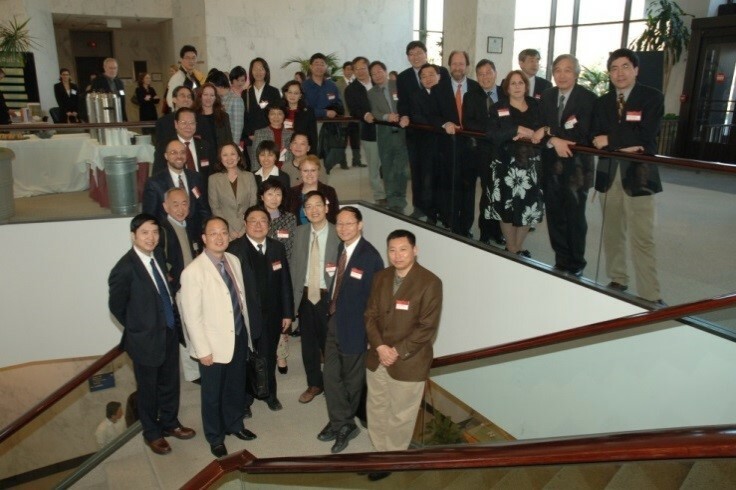 On November 3, 2014, in Bethesda, Maryland, OCCAM/NCI held a meeting to examine the potential utility and feasibility of establishing an International Consortium for Chinese Medicine and Cancer. At the meeting, participants from China, the U.S., Canada, Australia, and Korea discussed issues in Chinese medicine and cancer research, treatment and management, including potential mechanisms of action, proof of efficacy, side effects, regulatory issues, and the need for improving the quality of randomized clinical trials of CM treatments and supportive care interventions. With the support from OCCAM/NCI, Cancer Institute of CACMS and scientists and practitioners from the US, China, Korea, Australia, ICCMC is officially established on October 17, 2015 in Dalian, China. ICCMC will be an international Chinese Medicine and Cancer research platform to promote the basic research and clinical trials as well as symptom management of cancer all over the world. To develop exemplary guidelines for CM oncology clinical trials. Define the minimum or essential components for designing and reporting such trials. To establish a database of Cytochrome P450 enzyme interactions between Chinese medicine herbs and oncology drugs. Much of this data exist; it just needs to be organized. 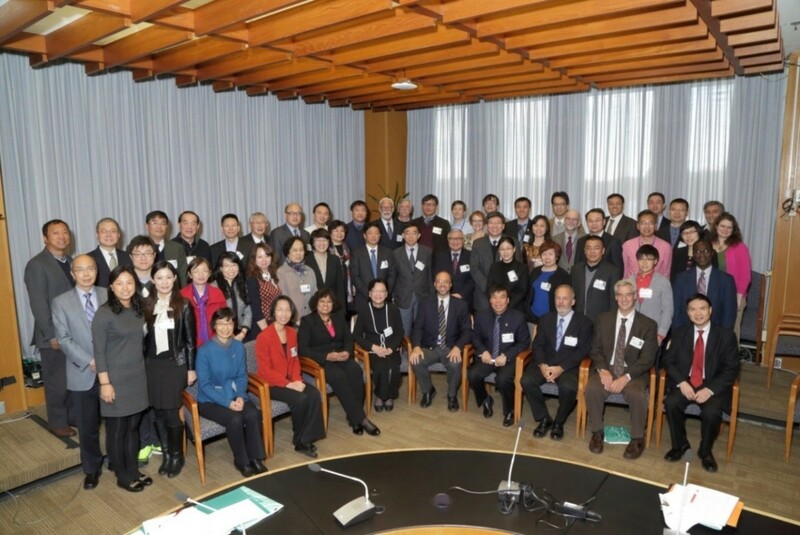 The International Consortium for Chinese Medicine and Cancer (ICCMC) planning meeting was held at NIH, Bethesda, USA on November 3rd, 2014. The inaugural meeting of International Consortium for Chinese Medicine and Cancer (ICCMC) was held in Dalian, China on October 16 – 18, 2015. 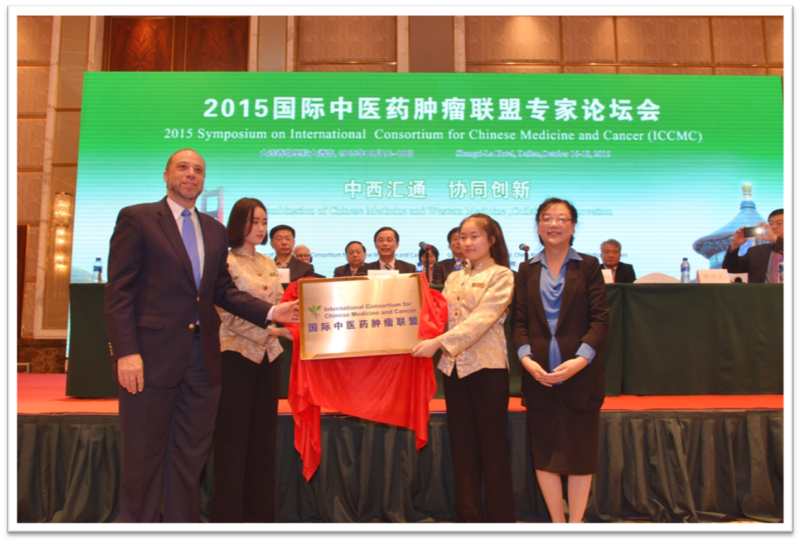 Dr. Jeffrey D. White of OCCAM/NCI, US and Dr. Hongsheng Lin of Cancer Institute of CACMS, China opened the name plaque of ICCMC on the International Consortium for Chinese Medicine and Cancer (ICCMC) inaugural meeting in Dalian, China, October 16 - 18, 2015. White JD, Lin HS, Jia, LB, Wu WS, Lam S, Li J, Dou JH, Kumar N, Lin LZ, Lao LX. 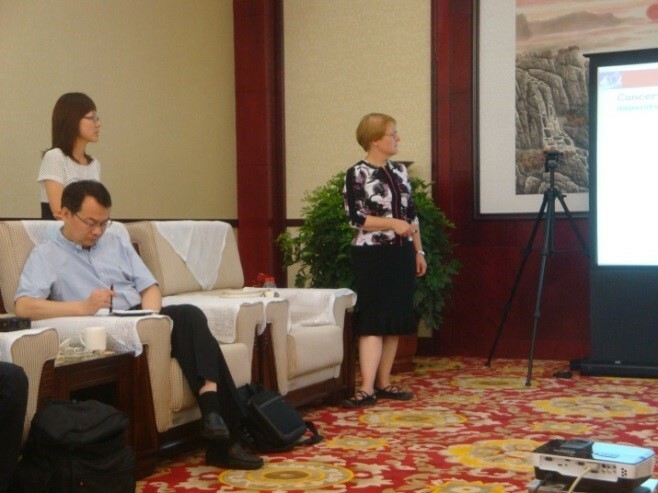 Proceedings of the Strategy Meeting for the Development of an International Consortium for Chinese Medicine and Cancer. Journal of Global Oncology, September 7, 2016; DOI:10.1200/JGO.2016.006635.